Spicy, pungent, and warming all describe the commonly used spice known as ginger (Zingiber officinale ). Ginger has a long and well-documented history of culinary and medicinal use and many of its health benefits, such as helping with nausea and motion sickness, have been substantiated in scientific research. Meltzer's Ginger mints contain standardized ginger root which contains 5% gingerols to ensure consistent levels of active components. Meltzer's ginger is supercritical extracted (made without dangerous solvents) and not irradiated - for the highest quality ginger mints they could make! The use of ginger dates back many centuries. It was commonly used throughout Asia and Europe. Chinese herbalists traditionally use ginger to expel cold and rekindle the body's warm fires. It is also used for some types of intestinal discomfort, cough, and body aches. The most widely known use of ginger today is for nausea and motion sickness, thus giving some western insight as to why, in China and India, ginger is believed to stimulate and strengthen the stomach. Modern research on nausea and motion sickness used approximately 1 gram daily which is equivalent to about 6 servings of Meltzer's Ginger mints. 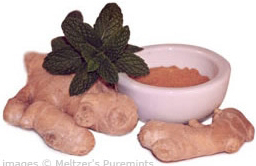 Meltzer's ginger mints contain a standardized ginger extract, not just regular powdered ginger. Research has also found ginger to be a powerful antioxidant. Ginger has also been shown in research to have a regulatory role in the natural inflammatory response of the body. In India ginger is applied as a paste to the temples to relieve headache.